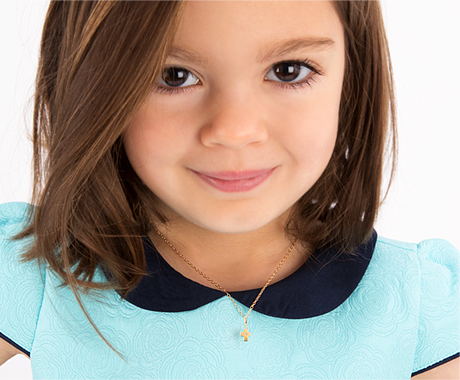 A personalized necklace is the perfect gift for her First Holy Communion. This tiny round pendant, professionally engraved with your little girl's initial or monogram, is simply stunning. With your choice of included religious charm, and optional other charms, you can make is something truly meaningful! Even if your sweet princess doesn't live nearby, her gift will arrive ready to give, beautifully presented in Tiny Blessing's signature gift wrapping. A precious necklace that will mean so much to her, being a cherished addition to her jewelry collection. Tiny and sweet, this pendant is sized perfectly for children. She will feel so special, knowing it was designed just for her.